(Caterpillar, Spicebush Swallowtail (Papilio troilus) - 01) In October we spotted this spicebush swallowtail caterpillar crossing the road near our home. 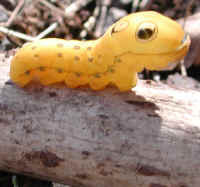 Spicebush swallowtail caterpillars usually stay in leaf folds of spicebushes and sassafras trees during the daytime and come out to feed at night. 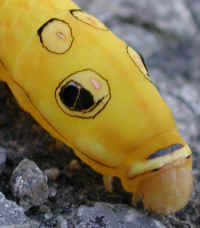 The decorative false eyes seem to serve as a deterrent to predators. 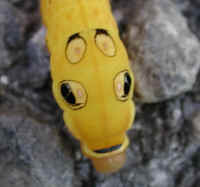 (Caterpillar, Spicebush Swallowtail (Papilio troilus) - 03) The fact that the false eye spots even swell out from the spicebush swallowtail caterpillar's body, as do actual eyes, is proof to us that these little souls were created by intelligent design. (Caterpillar, Spicebush Swallowtail (Papilio troilus) - 04) After taking this photo, we helped our spicebush swallowtail caterpillar friend to safely cross the road. (Caterpillar, Spicebush Swallowtail (Papilio troilus) - 05) After gently setting down this 3 cm. long spicebush swallowtail caterpillar on a dead stick off the side of the road, he or she seemed to take up what might be a defensive posture to intimidate a predator by lifting up the forepart of the body to more resemble a much larger head. (Caterpillar, Spicebush Swallowtail (Papilio troilus) - 05a) The pinkish orange color of the spicebush swallowtail caterpillar's head, when lowered, makes it look like the tongue of a larger being. 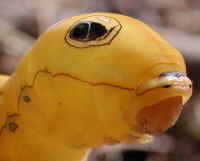 In this pose, the caterpillar tucks in his or her front legs to look more like a lower jaw, and the "hood" takes on the appearance of an upper lip. (Caterpillar, Spicebush Swallowtail (Papilio troilus) - 06) In this pose, the spicebush swallowtail caterpillar also seems to resemble an inflatable pool toy we remember seeing when our daughter was young. (Caterpillar, Spicebush Swallowtail (Papilio troilus) - 07) We did not want to disturb this spicebush swallowtail caterpillar any more by handling him or her. We suspect that the spots below the horizontal line also contain the spiracles, or breathing tubes. With this last look, we went on our separate ways. 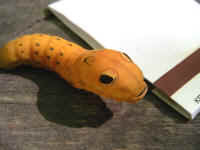 (Caterpillar, Spicebush Swallowtail (Papilio troilus) - 08) Lisa sent us this photo of a spicebush swallowtail caterpillar that her daughter found outside at the neighbors. She said: "We have managed to find green ones similar to it on-line but not orange like hers. It is very interesting. (Caterpillar, Spicebush Swallowtail (Papilio troilus) - 09) We received this and the following photo from one of our visitors, Joanne Timmons, Malden, MA. She wrote, "I encountered this little creature while camping at Nickerson State Park in Brewster (Cape Cod), MA last week." Thank you Joanne! (Caterpillar, Spicebush Swallowtail (Papilio troilus) - 10) This is another photo that we received from Joanne Timmons, Malden, MA. 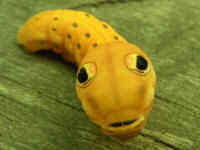 (Caterpillar, Spicebush Swallowtail (Papilio troilus) - 11) This photos was submitted to us on 20 Sep 2010 by Paul Benjamin Studios [email protected]. Thank you, Paul. 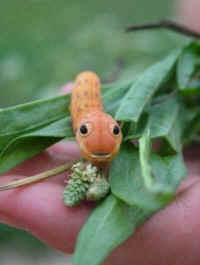 (Caterpillar, Spicebush Swallowtail (Papilio troilus) - 12) This photo of a spicebush swallowtail caterpillar was sent to us by Ruben Morales. Thank you Ruben.